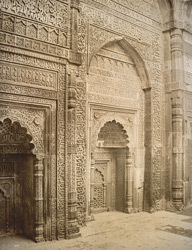 Photograph of carvings on the interior of Iltutmish’s Tomb in Delhi, taken by Lala Deen Dayal in the 1890s, from the Curzon Collection: 'Views of places proposed to be visited by Their Excellencies Lord & Lady Curzon during Autumn Tour 1902'. Iltutmish's tomb is situated at the north-west corner of the Quwwat-ul-Islam mosque in the Qutb complex to the south of New Delhi. The Qutb is all that remains of the first Islamic city of Delhi established by Qutb-ud-Din Aybak (r.1206-1210), the founder of the Slave Dynasty and first Sultan of Delhi. Shams-ud-Din Iltutmish (r.1211-1236) was the third Sultan of Delhi. His tomb, built in 1235 before his death, is the first surviving tomb of an Islamic ruler in India. It was designed as a square building of red sandstone with openings on three sides and a dome, now fallen. This is a view of the interior walls of the tomb, which are covered with rich decorative carving, a mixture of Koranic inscriptions with rosettes, arabesques, and tracery.